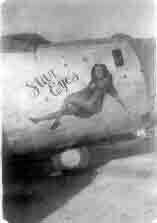 Note sign: "34 months overseas"
B-24 Nose Art "Star Eyes"
Hilburn is from Dallas, Texas. During WWII, he served in the Pacific as an armor, fusing bombs and loading .50 cal ammunition with the 41st Fighter Squadron. During his service, he served at a list of airfields that reads like the pages of a history book, and defines the American campaign in the Pacific. I came to service as many others and did not want to be drafted. I had much religious training in my life and going to war was not for me. I volunteered as a religious objector and put my papers in the post office. I could not sleep that night. It was a most troubling time. The next day I went to the Post Office and withdrew my papers and scratched out the objector clause. That was also a traumatic time for me. 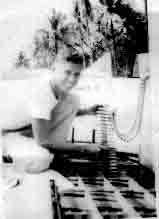 I went to basic training at Duncan Field in San Antonio. Because of my machine shop training and working on planes I was sent to a technical training school in Buckley Field Colorado. After that, I was waited to be assigned to go to the war zones. I boarded a ship in California and landed in Brisbane on June 19, 1943, my 21st birthday. We were given canvas mattress covers and we had to fill them with hay and slept on the ground. 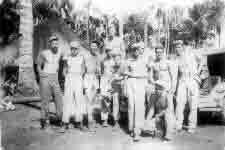 We were put on a train and I think it was 3 days to Mackay and got to bed in the middle of the night but were awaken at sunrise and out on C-47 and went to Port Moresby where the 41st Squadron was. My first assignment was to go to the port and in the hold of a ship and unload bombs. We would place a hook on a bomb and they would lift out 5 at a time. When the ship was unloaded I did not have to go back there again. I was at Moresby only about a month. Next we went to Tsili-Tsili that was not too far from Lae where the Japs were still there. On my first landing there there was a dog fight going on right over the field. Of all the bombing raids I have ever been since I was the most scared that day. 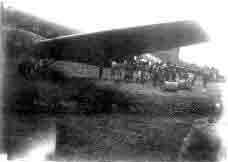 The only fuel we had was flown in from Moresby and one assignment was to fly back and forth to get aviation fuel. We loaded 7 55 gallon drums and went back to Tsili-Tsili. Many times we were turned back by Zeros. I remember a P-40 across the runway from us that a Jap bomb went through the wing. It was a dud and just made a clean hole. Seeing the only Jap prisoner being held by M.P. 's in a small cage at Nadzab. He was near our flight line and waiting transportation out. Because of being inquisitive, all wanted to see him. I gave him a roll of Life Savers mints which he accepted gratefully. I do not believe he would have weighed 110 lbs. I was an armor, hanging and fusing bombs and putting in .50 cal ammo. 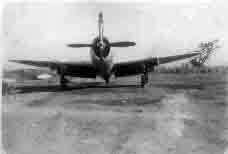 We had P-39's at Gusap and Nadzab and we got P-47. The fields were primitive. Sometimes we would have a few 100 foot of marston matting if it was available. About mid afternoon a Zero approached field at pattern alt. and slow speed. There was no alert sounded. He was down wind, made a left turn and lined up on strip before an alarm was sounded. We had a P-47 up with a new engine getting solo time on it. This pilot was in the right place to get on his tail. One short burst and then the Jap tried to leave but it was too late. I am sure that he was lost and wanting down. There is no other reason he would have been alone and coming in so low and slow. It was a sad event that did not have to happen. This was all in plain eyesight of the airfield. It has always been my opinion that he was lost and looking for a place to land. Most certainly, this belief could not be debated under circumstances, but why was he alone at slow speed?" 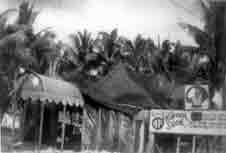 I was in a little field hospital which was located in a beautiful coconut palm grove. I am guessing the runway was about 5 miles from it. We believed it was property of Palmolive Peat Company. The palm grove was somewhat higher ground and made visibility good. Anyway I was in the chow line for breakfast when 5 fighter planes came over heading for the airfield. They were not Zeros as they did not have radial engines. As they flew by people in the chow line wondered what they were. At that moment 50 cal tracers filled the air around the airfield. The 5 planes went right on through it. AA guns were all around the field and as I remember each battery had 4 50s' on a platform that turned 360 deg. How they all missed is a miracle. I do not know if and damage was done but 41st received none. Also while I was in the hospital John Wayne came in visiting and I played a game of chess with him. I have his autograph on my photo album." Shrapnel like Texas hail stones! Who can remember how long it took ack-ack shrapnel to fall to the ground after a night raid on Owi Island? The falling fragments of exploded shells would develop an aerodynamic spinning and could be heard very clearly as a buzzing. On hitting the ground, they sounded like west Texas hail stones! I don't know the Chaplain's name or pilot who was buried wrapped in a shelter half at Moratai But serving on an honor firing squad at the burial, I remember the event as a very dignified, eloquent and stately service. And other truths we know. He showed it could be followed. For even deaths long knife. who with their lives did pay. We saw him lead the way. His smile a wholesome thing. we lost our finest men. He was my best pal, "Joe". The month of November was rough. 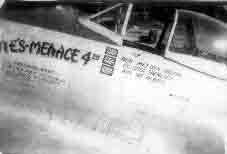 It ended in a bang when on the 26th, three Nip bombers came over and dropped an undetermined number of bombs in our revetment area, damaging several of our P-47's. Three of the planes had to be turned over to the Service Squadron for repairs. 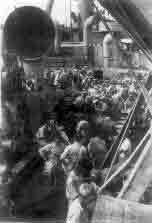 The Japs returned the following night and dropped approximately twenty bombs. 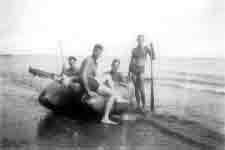 Four of these bombs struck in our camp area killing four enlisted men, S/Sgt Earl Osborn, Sgt. Woodrow Freiberger, Corporals Walter Gentile and William McClain. Their foxhole had received a direct hit. This was not a harbinger of things to come, because in December we had a relatively easy time of it. There were 32 red alerts and 13 more bombings. Bombings that affected our forces were on the nights of the 14th when four bombs were dropped in the 5230 2nd Emergency Rescue Squadron, killing one man and wounding two others, and on the night of the 25th when 12 bombs were dropped on Pitoe Strip destroying 2 medium bombers. It was during this raid that the Spitfire shot down the Nip bandit. Everyone was out of their foxholes, cheering like hell. The Spitfire did what the ack-ack boys and P-61 had tried to do for two months, shoot down a Nip over the field. Our tactical mission for the month of December was to cover 13th Air Force Bombers on strikes over Cebu, Negros, Borneo and Mindanao. 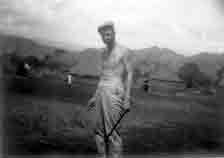 Our secondary missions were Fighter sweeps and patrols. The success of these cover missions was outstanding in that not one bomber was lost due to enemy interception. Our fighter sweeps took us over the same areas in which we covered the bombers. 2. Tracer, which burned red on firing and had a red colored nose. 3. Incendiary, which burned on impact and was colored blue. 4. Armor piercing, had regular copper jacket with needle sharp hardened steel interior. It had a black nose. What we used was called two-two and one. That meant two armor piercing one tracer and two incendiary. I do not remember us using ball except when firing guns for converging purposes, and they were not belted but put in one at a time. The 50 cal. fires at 15 rounds per second. This meant that when the trigger was depressed, you were firing 120 rounds per second. Twenty tracer, 50 incendiary and 50 armor piercing. We had bad prop was problems and sand and dust had to be cleaned with each flight. The most from the inner guns, and a little less as you moved outward. Built on the longest tree logs available must have been difficult at Moratai. As the American force was growing there, the traffic was very heavy. Two C-47's were making landing approaches one over the other. Many troops were waving frantically and the tower was shooting red flares. When the impending tragedy was recognized by the pilot of the upper plane, his obvious reaction was to pull the wheel into his stomach. This caused a stall and he crashed about 40 feet from our "D" flight. The craft exploded into flame, and all of our crew one ran for safety in the palm trees along the runway. The one man whose name was Pearlstien went with a pry bar and was able, with the help of others inside to open the cargo door. They all got out. He was never recognized for an act of bravery and courage, nor was the others of us court-martialed for escaping the danger.